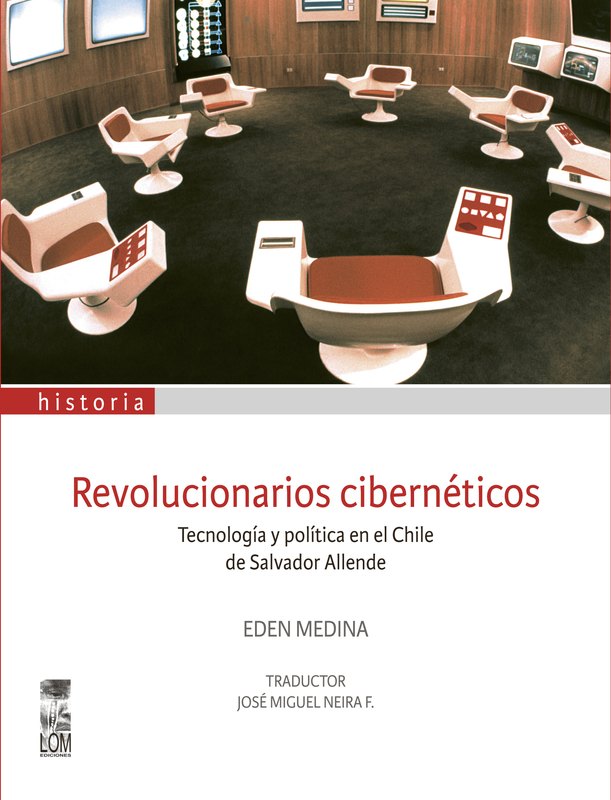 Eden Medina has written one of the most fascinating books about Chile’s recent history, Cybernetic Revolutionaries (MIT Press) published originally in 2011 and recently translated by LOM as Revolucionarios Cibernéticos. Tecnología y política en el Chile de Salvador Allende. From a STS approach, and based on archive material and extensive interviews, the book describes in detail the history of ‘Proyecto Synco’, the attempt lead by British cybernetician Stafford Beer and Fernando Flores to coordinate and manage the Chilean socialist economy. Taking the translation of the book as an excuse, we asked Eden to talk to Estudios de la Economía. The only problem was that at that time, November 2013, we were each in a different country, Eden in the US, Manuel in the UK and José in Denmark. But we finally had the Skype conversation we share with you here. Unfortunately, at the time of the meeting Manuel was in a very noisy café. Therefore, some parts (particularly answer to question 1) are difficult to hear. Anyway, we are very happy to share this podcast, hoping it will motivate listeners to read Eden’s book and inspire more detailed historical research of this kind. Q1. Cybernetic Revolutionaries (CR) could be read as a story about a very particular form of expertise: the engineering expertise. It is in many senses a book about a way of governing the social that entailed the design of very concrete – and sometimes very grandiloquent – material apparatuses, machineries and infrastructures. Governance as an act of taming the (political, economic, collective) world via the inventiveness of bright, hands-on scientists capable of building “big things.” However, it looks like this form of expertise in Chile has in many ways disappeared – to give way to the more abstract knowledge of economists. While reading the book, it seems to me that CR could be read as a tribute to that engineering expertise and knowledge. Do you agree with this? And more amply, what do you think is the contribution of this engineering culture/expertise today in Chile? Q2. CR tells the story of a cohesive group of experts that attempted to re-arrange the economy in Chile. While reading it, I thought a lot about another group that could be described in the same terms, but which has received a much wider academic attention, namely the Chicago Boys. My next questions will try to make you to play with the parallelism between both groups. Would you agree to call Synco a failure and the Chicago Boy experiment a success? More generally, do you think is possible at all to assess success from the STS point of view followed in your research? And, do you think your book could help us to better understand the different endings of the Chicago and Synco Boys adventures? Q3. CR questions distinctions normally used when talking about economic expertise in Chile. On the one hand, conservative economists usually oppose “technical” (ie. theirs) decision making and “populism” (meaning the “nonscientific attempts” to run the economy by the engineers of the ‘Unidad Popular’ government). On the other hand, critical social scientists distinguish between “democratic decision making” and “technocracy” (the latter normally meaning economists that have given themselves the authority to design social policy on the basis of their academic credentials). In this direction, you decide, early in the book, not using the term “technocrat” to refer to the Synco boys, coining instead the notion of “tecnólogos”. Your book, though, also questions these oppositions: it shows how both the UP and the dictatorship can be seen as techno-scientific experiments that tried to reassemble the economy in Chile. While reading the book, and inspired by other authors, I thought about other commonalities among both groups. Philip Mirowski (see this interview) has seen an isomorphism between contemporary neoliberal economics and cybernetics, for instance in the prevalence both communities give to information and distributed, des-centralized, knowledge producing systems. And of course, there is Fernando Flores who has become the stereotypical example of what Nigel Thrift has called “knowing capitalism”. Could you see some of these similarities or how really different were these two groups? Q4. As an experimental device, Cybersyn was very interesting because although it was a highly technical and science-based apparatus, it promoted (and was based on) a speculative mode of thinking and decision-making based on performance, play, material tinkering, embodied cognition. In the Opsroom, the knowledge about the economy was provoked into being in its performative staging: policy-makers would gather in the room not to take the best decision relying on the information displayed – as if the decision was already there, waiting to be discovered. Instead, it seems that the Opsroom was a space to create a decision by playing around with data and metal pieces on a board, drawing models, communicating with workers in real-time, discussing with colleagues (with the help of pisco sours). It seems to me that that was one of Cybersyn’s most interesting contributions, the possibility of a more experimental, performative and speculative way of taking decisions. My questions are: What type of value do you think this speculative and performative way of producing knowledge has today? Or put another way: Compared to the objectives and procedures of Cybersyn, however idealized they were, what do you think about the way policy decisions are taken today, or about the way science and technology is utilized today to produce “decisions”? Is there something that we could learn from Cybersyn? Q5. The Cybersyn, socialism “con empanadas y vino tinto”, “the neoliberal experiment”. It seems that Chile is particularly prone (or keen) to experiments. Do you agree? If yes, any hypothesis? « Why Michael Lewis got it wrong.